Gustav can communicate to Chef Kitteh how many cookies to make using price signals. 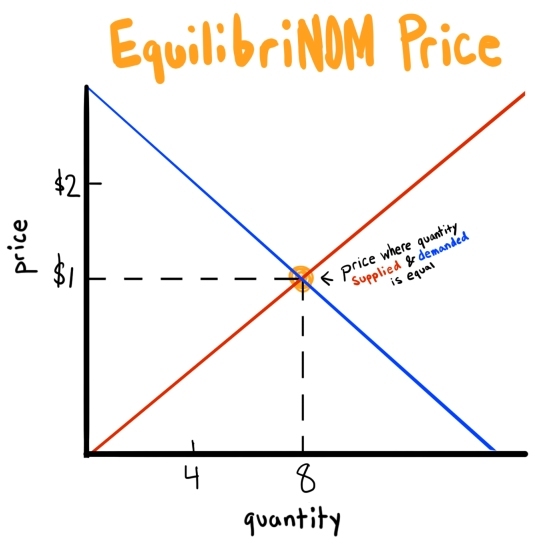 When we overlay the supply and demand curves, they cross at a certain point. The price at the point where they cross is important because consumers will demand the same amount that producers will supply at that price. If Chef Kitteh can sell a cookie for $1 but it only cost her 50 cents to make, she makes a profit of 50 cents. 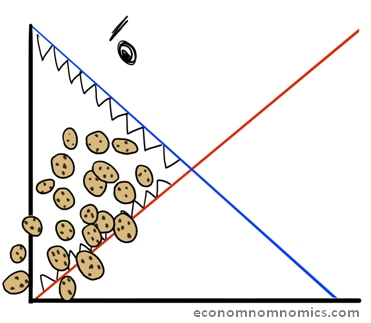 If Gustav values a cookie at $2 but only has to pay $1, he benefits by a dollar. Surplus was generated and now everyone is better off. The surplus in the graph to the right is the triangle space above the supply curve and below the demand curve. Stay tuned for more economnomnomics. Contact us to let us know what you think and what you might want to see more of. This entry was posted in Prices. Bookmark the permalink.